The New York Pipe Club (NYPC) was conceived as an idea in the mid 1970's with a call from Harvey Silver to all New York area pipe smokers via Tom Dunn's publication and labor of love, The Pipe Smoker's Ephemeris, but it was not formally organized until the early 1980's, and has been active ever since - naturally, with some ups and downs. The main factors in the Club's success over the years have been: 1) committed leadership; 2) availability of a suitable meeting place and 3) guest speakers and other special program activities. The NYPC was led for many years by co-founding member and first President, Sailorman Jack ("ATTENTION! ATTENTION! "), who, sadly, passed away in 2006, and in more recent years by David Siegel, Vernon Vig and most recently, Lou Carbone. A solid core of founding and early members continues to be active; they can be counted on to attend meetings and remain a driving force. The NYPC has also attracted a significant number of new members in recent years, including several young men and a few women, who are eager to learn about pipes, pipe tobacco, pipe collecting and pipe smoking. We recruit in local pipe shops, at pipe shows and on the street; anyone with a pipe is fair game. We are always looking to share the enjoyment of our time honored and noble hobby. The current membership list contains close to 200 names; attendance at meetings is usually in the 20 - 25 range, although on occasion we attract 30 or more. Our monthly newsletter is sent to just shy of 300 email addresses! The NYPC currently meets once each month, on the second Tuesday. We've tried meeting twice a month for two years or so and many enjoyed this. However, two meetings turned out to be too much and tended to dilute attendance at all meetings. Current meeting location, Circa Tabac. Bottom: November 2006 meeting at former meeting place, Florio's. The NYPC has never had a dedicated meeting place and had difficulties from the outset (well before any anti-smoking laws) in finding smoker-friendly locales. We have met in various bars and restaurants for periods of time, but we've had to move to new locations many times over the years, which often proved to be disruptive. The club has flourished during periods when a suitable meeting place was available. For example, attendance was very high when the club had the use for about two years of a large upstairs private room in an Irish pub with excellent food and drink service. This arrangement unfortunately ended when New York adopted its strict law prohibiting smoking in any establishment with paid employees. After enactment of the smoking ban, the NYPC has met in certain cigar bars which were grandfathered exempt and was welcomed for a while at a few local NYC tobacconists, however, these arrangements ended because they evidently were not economically attractive to the establishments (i.e, we did not spend enough!). The Club met consistently for a number of years at Florios Grill & Cigar Bar in Little Italy and enjoyed the ebbs and flows of attendance where we gained many new members including a number of younger pipe smokers. The Club enjoyed a good period of growth during that time. 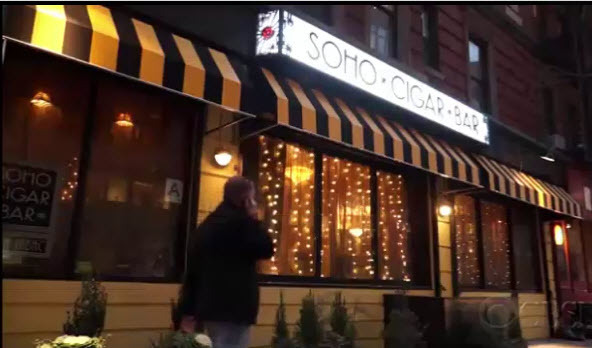 We are presently very fortunate to meet at SoHo Cigar Bar, formerly, Circa Tabac, a 1920's "Speakeasy" style restaurant and cigar lounge located at 32 Watts Street in SoHo, Manhattan, NYC, which still permits and encourages smoking! The food and drinks are great and the management and staff are very welcoming; they reserve tables for us each month and give us as much room as we need. We try to maintain our part of the bargain by urging all members to purchase dinner, drinks and by applying a 20% across-the-board service charge to all bills. In earlier years NYPC meetings were quite commercial, with several members (including Sam Barnett and the late Prof. Tom Colwell), bringing pipes to trade or sell. We continue to do some business with members offering pipes and tobaccos for sale or trade. Of course no meeting is complete without the usual "show-and-tells" of our recent pipe and tobacco conquests, but they have become much more of a social event. We also have had several interesting speakers during the past few years, including Rich Esserman (on large pipes - surprise! ), Jacques Craen, maker of Genod Pipes of St. Claude, France, the birthplace of the briar pipe, Kurt Balleby on Danish pipe making, Gennaro Filosa (an oral history of the Wilke Pipe Shop where he worked 17 years - fantastic) and, more recently, Nanna Ivarsson of Denmark. It is clear that a celebrity guest speaker increases interest and attendance. To increase exposure and attract more attention to its activities - and more members! - the NYPC has modernized and expanded its website www.newyorkpipeclub.com. In addition to providing information about upcoming monthly meetings, we now post reports and photos after meetings and shows, provide additional information about the pipe smoking hobby, such as news of interest, upcoming events, (ATTENTION, ATTENTION!!! ), blogs from pipe smokers as well as to direct folks to pipe and tobacco related websites that will interest them. We have also embraced social media utilizing a Club Facebook page and Twitter account. The NYPC is a very informal group that has no legal status, officially elected officers, except that of president or rules. It counts on volunteers and operates on consensus. Members are asked to pay voluntary annual dues of $25 to help support the website and other incidental expenses. At some meetings we raise money by raffling off pipes, tobacco or related items contributed by members, and we also sell club pins, logoed hats, shirts and other items. The NYPC does not organize or produce the NY Pipe Shows, but does all it can to support them. In short, while we are subject to the ebbs and flows of membership numbers, the NYPC is holding its own and even growing a little despite the current hostile anti-tobacco environment. This is no doubt due to a number of very loyal long-time members, the shared passion for pipes and pipe smoking, the desire to share our passion with others and, most importantly, the fellowship and strong friendships that have developed over the years. This is a close group that welcomes all and is committed to sticking together to enjoy our hobby! ALL NEWCOMERS AND VISITORS TO THE NEW YORK AREA ARE INVITED TO ATTEND NYPC MEETINGS. YOU WILL ALL BE VERY WELCOME!